Hello Loverlies. 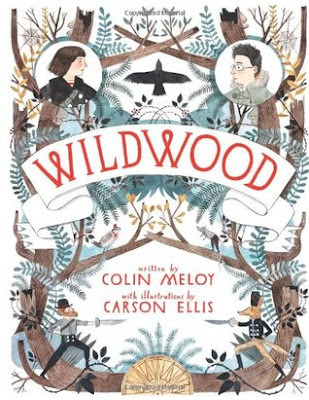 It has been quite a lot of times that I have seen this book called Wildwood by Colin Meloy in Hastings. I just kept passing it by. Well finally I started going back to the library and there it was! My Review: The cover of the book is so inviting I just had to rent it and read it finally. I will say for a tween book, it has over 500 pages. Usually I thought they had shorter pages normally for tweens. It is good Meloy decided to write a book this long for this age group. I believe it challenges them to get into more books that are longer. I found this to be a great fantasy book! There is a lot of action to keep anyone entertained. I find it interesting when reading about these two teenagers trying to get Prue's brother back. What happened at the beginning of the book is Prue's baby brother gets carried off into the Impassable Woods. That is what her parents call it. So of course Prue is going to go after her brother and her friend Curtis just decides to follow her in there. There are a lot of complications and situations they seem to stumble into. Something else I found interesting is the illustrations they show throughout the book. I just seem to like this type of art. one more thing I must not forget is I love how in the woods you can speak to animals. If I had one superpower, I would speak with and understand animals. Silly I know, but there are so many times I need to know what my cat's are saying to me! This story also is told in two point of views, But they little brackets so you can tell where a new part will start. I like when authors at least give you something to show when the new point of view will start. If you aren't too scared to read a tween book just because you are older than tween. I say give this book a try, because you might find it interesting. You never know if it's a good book until you attempt to read it. Have a blessed Day!